Connie's playroom: Just a challenge more...! Nok en utfordring i kveld, og denne går ut på å ha en bygning eller et hus på prosjektet eller kortet! Jeg har brukt et stempel fra Judith Design, Kreativ Hobby og Stampotique. Stæsjet er fra Tim Holtz, og die cuts er fra Cuttlebug. One more challenge tonight, as I am in real creative mood :-) The challenge was to make something with a building or a house, and I made a huge tag. The tag is 4 1/4 x 8 1/2 inches, and I bought that in Seattle during my last trip. Stamps are from Judith Design, Kreativ Hobby and Stampotique. 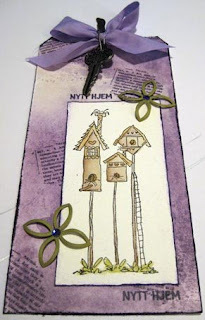 Assessorises are from Tim Holtz, and die cuts from Cuttlebug. So gorgeous and lovely tag. Connie my friend, I wish you all the best for 2009. Wow love this tag - awsome stamps! You should join in with out Tag You're It Challenge on Fridays!